Given the drawbacks of surgical procedures for Achilles tendinopathy, orthobiologic options may provide possible alternatives for these patients. Accordingly, this author takes a look at the research and shares his clinical experience with modalities such as platelet rich plasma and amniotic membrane. 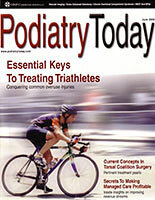 Achilles tendinopathy can be a complex and difficult orthopedic pathology. Acute Achilles tendinitis typically responds well to conservative therapy including rest, immobilization, anti-inflammatories, stretching and physical therapy. However, chronic Achilles tendinosis is a complex pathology involving microscopic degenerative injury to the tendon with local disruption of the collagen matrix and microscopic degenerative injury. With chronic Achilles tendinosis, there is also evidence of erratic blood flow with zones of hypovascularization and hypervascularization. This condition usually affects the midsubstance of the tendon, 2 to 6 cm from the insertion point, but can also involve the insertion point itself. Patients with chronic Achilles tendinosis typically present with local fusiform swelling, tenderness, loss of ankle motion and pain with ambulation. Due to the high failure rates and prolonged recovery from open surgical intervention of Achilles tendinosis, there is growing interest in the use of orthobiologics to augment healing. The philosophy behind the use of orthobiologics is not novel but the technology seems to offer superior outcomes to previous therapies. In the past, surgeons used dry needling of the tendon or deep fiber massage of the tissue to break up scar tissue and increase blood flow to the affected area. Tendinopathy is commonly associated with scar tissue and a lack of vascularity to the damaged region due to the body not responding to the damaged tissue any longer. By adding certain growth factors to the damaged tissue and increasing blood supply to the damaged tissue, this increases the necessary factors that allow for soft tissue healing. It is important to consider the addition of protection of the damaged region through the use of a boot or a cast with possible crutch use to decrease stress on the tissue and facilitate the improved healing of the affected region. It is also important to consider and alert patients that multiple injections may be necessary to continually increase the body’s response to the damaged region for optimal results. Usually, one spreads out injections every three to four weeks and two to three injections are often necessary. Platelets are small, non-nucleated bodies found in peripheral blood. Normal platelet count in circulating blood ranges from 150,000 μL to 400,000 μL.1 Enhanced healing has been associated with platelet concentration of at least 1,000,000/μL in 5 mL of plasma. Platelet rich plasma (PRP) enhances healing by the direct delivery of increased growth factors and cytokines from the alpha-granules contained in platelets. Transforming growth factor-beta. The functions of TGF-b include collagen synthesis in outer skin cells, growth inhibition in fibroblasts and apoptosis in monocytes. Platelet-derived growth factor. The target cells/tissues include fibroblasts, smooth muscle cells, chondrocytes, osteoblasts and mesenchymal stem cells. The functions of PDGF consist of potent cell growth and recruitment, blood vessel growth, granulation, growth factor secretion, and matrix formation with bone morphogenetic protein. Insulin-like growth factor. The functions of IGF include cell growth, differentiation and recruitment in bone, blood vessels, skin and other tissues as well as collagen synthesis with PDGF. Fibroblast growth factor. When it comes to basic FGF, functions include cell growth in blood vessels, smooth muscles and skin, and cell migration in fibroblasts. Epidermal growth factor. Epidermal growth factor. facilitates cell growth, proliferation and differentiation. Vascular endothelial growth factor and endothelial cell growth factor. Their functions for targeted blood vessel cells include cell growth, migration, new blood vessel growth and anti-apoptosis.1 Platelet rich plasma is concentrated from anticoagulated whole blood. Citrate is an initial addition to drawn blood that binds the ionized calcium and inhibits the clotting cascade. Technicians then perform a two-step centrifugation. The initial centrifugation separates the red and white cells from the plasma and platelets. The second centrifugation further separates and concentrates the PRP from the platelet-poor plasma. The isolate clots to allow for delivery to the treatment site. Timing the addition of the clotting agent and injection is important because as platelet activation occurs, it releases approximately 70 percent of growth factors within 10 minutes. However, other authors report that PRP has similar results to placebo/saline injection therapy. In a randomized, controlled trial, De Vos and coworkers studied 54 patients with chronic tendinopathy 2 to 7 cm above the Achilles tendon insertion.6 Patients did eccentric exercises and received either a PRP injection or a saline injection. The authors concluded that the PRP injection did not result in greater improvement with pain and activity. Filardo and colleagues published a case series with follow-up at four years following a PRP injection series.8 The study focused on 34 Achilles tendons that failed conservative or surgical therapy. The authors’ PRP preparation technique consisted of 150 mL venous blood samples. First, clinicians used a centrifuge at 1,480 rpm for six minutes and subsequently used a second centrifuge at 3,400 rpm for 15 minutes to concentrate platelets. The treatment cycle consisted of three intratendinous injections of 5 mL PRP at two-week intervals. The study authors evaluated the patients at baseline, two months, six months and up to a mean of 54.1 months. In regard to the patient evaluations, the authors used VISA-A and EQ-VAS (for general health) questionnaires as well as Tegner scores. The authors found significant improvement in all scores from baseline at each assessment. They also found that 89 percent of patients returned to sport and 93 percent were satisfied and would repeat the treatment if needed. Deans and coworkers reported a study of 26 patients with painful and ultrasound-confirmed Achilles tendinopathy who had symptoms for a minimum of six months.4 Patients received intratendinous PRP injection and a standardized rehabilitation protocol, consisting of full weightbearing in a pneumatic cast boot for six weeks, therapeutic ultrasound treatment and an eccentric exercise program. They reported statistically significant improvements in pain, activities of daily living, participation in sports activities and quality of life. In a prospective study, Gaweda and colleagues evaluated the effectiveness of non-insertional Achilles tendinopathy treatment with autologous PRP in 14 patients (15 Achilles tendons).9 The authors utilized ultrasonography and power Doppler ultrasonography of the area. During follow-up, they noted a significant improvements in the clinical and imaging results with improvements in the AOFAS scale and the VISA-A scale. Unfortunately, variations in PRP preparation, rehabilitation protocols and data analysis have made it difficult to critically analyze the effectiveness of PRP injection for chronic Achilles tendinopathy. At our institutes, we utilize a multitude of PRP systems based on the mixture we are looking for. We find certain concentrations better for joint versus soft tissue uses and currently use the GPS III Platelet Concentration System (Biomet) for soft tissue procedures. Following local anesthesia for the patient, one would inject the PRP concentrate with ultrasound guidance, taking care to identify the most damaged region and utilizing a peppering technique with multiple passes of the needle into the damaged tissue. Allow the patient to ambulate as tolerated in a controlled ankle motion (CAM) boot with the addition of a 1-inch heel lift. Then instruct patients to refrain from anti-inflammatories and icing of the injection site. Follow patients at two weeks and perform a second PRP injection at about one month after the first injection. Then refer patients for physical therapy at about one month after the second injection to help facilitate scar break up. It is critical to alert patients that the procedure may take three months to fully work and resolve the issue. A new and possibly better option for the treatment of Achilles tendinopathy is amniotic membrane. Unfortunately, there is no currently published data on the injection of micronized dehydrated human amniotic/chorionic membrane (mDHACM) for the treatment of chronic Achilles tendinopathy. However, our personal experience over the past five years has shown an excellent response to the treatment with a decreased hyperinflammation effect in comparison to PRP. This lack of hyperinflammation has resulted in less patient pain post-surgery and an easier recovery period post-injection without any loss in the body’s own necessary response to the damaged tissue region. One study that we can use to compare outcomes involved the use of micronized dehydrated human amniotic/chorionic membrane to treat plantar fasciosis. Zelen and colleagues published a prospective, randomized, single-center clinical trial, showing promising results on the use of micronized dehydrated human amniotic/chorionic membrane for the treatment of plantar fasciosis.10 In their randomized study, 45 patients received an injection of 2 cc 0.5% Marcaine plain and then received either 1.25 cc saline (control), 0.5 cc mDHACM or 1.25 cc mDHACM. They found significant improvement in AOFAS hindfoot scores, the SF-36v2 Health Survey and pain scores at one, four and eight weeks after injection. Although the study was limited by the number of patients and a lack of long-term follow-up, it shows promising data for the use of micronized dehydrated human amniotic/chorionic membrane for chronic plantar fasciitis. The effectiveness of micronized dehydrated human amniotic/chorionic membrane for chronic Achilles tendinopathy warrants further investigation. At our institutes, we have utilized the injection of micronized dehydrated human amniotic/chorionic membrane in the treatment of plantar fasciosis and chronic Achilles tendinopathy with ultrasound guidance. The overall outcome has been comparable to PRP but with less of the inflammatory pain post-injection that is often associated with PRP injection. The amniotic membrane injections seem to calm the tissue without inflammation but still increase the necessary growth factors to restart the body’s healing potential to the damaged tissue region. The procedure for injecting amniotic membrane is similar to PRP without the need for a blood draw. We use local anesthesia, ultrasound guidance and similar post-injection boot protection to what we have used in PRP cases. Usually two to three injections are necessary and one should spread them apart by three- to four-week intervals. Patients often state they have relief of pain more rapidly than with PRP but overall tissue damage resolution is still a three-month process. The advent of orthobiologic therapies in the treatment of Achilles tendinopathy has dramatically improved patient outcomes without the need for aggressive surgical procedures. Patients are often able to continue their ambulatory status with protection and have little to no down time in comparison to surgical patients. The treatment also allows for the body to repair itself with controlled inflammation. Over time and with added research, specific mixtures of injections and biologics may allow for site-specific and structure-specific injection techniques to treat differing patient needs. For now, the additional orthobiologic options have allowed for improved treatment of patients in a rapid, cost-effective and non-invasive manner. 2. Kampa RJ, Connell DA. Treatment of tendinopathy: is there a role for autologous whole blood and platelet rich plasma injection? Int J Clin Pract. 2010; 64(13):1813–1823. 3. Gross CE, Hsu AR, Chahal J, Holmes GB Jr. Injectable treatments for noninsertional Achilles tendinosis: a systematic review. Foot Ankle Int. 2013;34(5):619-28. 4. Deans VM, Miller A, Ramos J. A prospective series of patients with chronic Achilles tendinopathy treated with autologous-conditioned plasma injections combined with exercise and therapeutic ultrasonography. J Foot Ankle Surg. 51(6):706-10. 5. Foster T, Puskas B, Mandelbaum B, Gerhardt M, Rodeo S. Platelet-rich plasma from basic science to clinical applications. Am J Sports Med. 2009; 37(11):2259-2272. 6. De Vos RJ, Weir A, van Schie HT, et al. Platelet-rich plasma injection for chronic Achilles tendinopathy: a randomized controlled trial. JAMA. 2010; 303(2):144-149. 7. Saxena A, Ewen B, Maffulli N. Rehabilitation of the operated Achilles tendon: parameters for predicting return to activity. J Foot Ankle Surg. 2011; 50(1):37-40. 8. Filardo G, Kon E, Di Matteo B, et al. Platelet-rich plasma injections for the treatment of refractory Achilles tendinopathy: results at 4 years. Blood Transfus. 2014 Jun 19:1-8; epub ahead of print. 9. Gaweda K, Tarczynska M, Krzyzanowski W. Treatment of Achilles tendinopathy with platelet-rich plasma. Int J Sports Med. 2010; 31(8):577-583. 10. Zelen C, Poka A, Andrews J. Prospective, randomized, blinded, comparative study of injectable micronized dehydrated amniotic/chorionic membrane allograft for plantar fasciitis—a feasibility study. Foot Ankle Int. 2013; 34(10):1332-1339. 11. De Vos RJ, Weir A, Tol JL, Verhaar JA, Weinans H, Van Schie HT. No effects of PRP on ultrasonographic tendon structure and neovascularisation in chronic midportion Achilles tendinopathy. Br J Sports Med. 2011;45(5):387-92. 12. Astrom M, Rausing A. Chronic Achilles tendonopathy: a survey of surgical and histopathological findings. Clin Orthop Relat Res. 316:151-164, 1995. 13. Paoloni JA, Murrell GA. Three-year follow up study of topical glycerol trintrate treatment of chronic noninsertional Achilles tendinopathy. Foot Ankle Int. 2007; 28(10):1064-1068. 14. Rompe JD, Furia J, Maffulli N. Eccentric loading component compared with shock wave treatment for chronic insertional Achilles tendonopathy. A randomized controlled trial. J Bone Joint Surg Am. 2008; 90(1):52-61.